Aerial and satellite systems – integrated reception systems (IRS) for communal buildings through to one-off jobs for domestic customers, e.g. fitting a new satellite dish to a house. Security systems – intruder alarms, CCTV, intercom systems, access control. Data network systems including fibre optics. Custom audio/visual – public address systems and integrated audio-visual systems. Our extensive customer portfolio includes local authorities and public sector bodies – hospitals, schools etc., housing associations and property management companies, construction and engineering contractors’ through to smaller private businesses and householders. 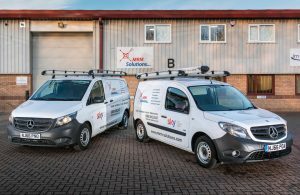 We thrive on new opportunities and challenges, and rather than having to use multiple contractors, our “one-stop-shop” approach means that we can fulfil your specific requirements, and even provide innovative integrated solutions. Our overall policy is to provide a customer-focused approach, complete all work to the highest standard and continually strive to improve the way we operate. We are also prepared to work anywhere across the UK as a means of expanding our customer base and geographic footprint.